Israeli-Palestinian Conflict: Many Palestinians Encouraged By John Kerry's Speech : Parallels As Palestinians watch Israeli settlements being built, many were glad to hear U.S. Secretary of State John Kerry say the construction undermines the chances of peace between Israelis and Palestinians. Jad Isaac surveys the Har Homa settlement from his office window. Isaac, director of a Palestinian organization for sustainable development, is encouraged by Secretary of State John Kerry's impassioned defense of the U.N. Security Council's condemnation of the Israeli government's construction of Jewish settlements in the West Bank. From his office in the Palestinian city of Bethlehem, Jad Isaac has a close-up view of the big debate that has erupted over Israeli settlements. 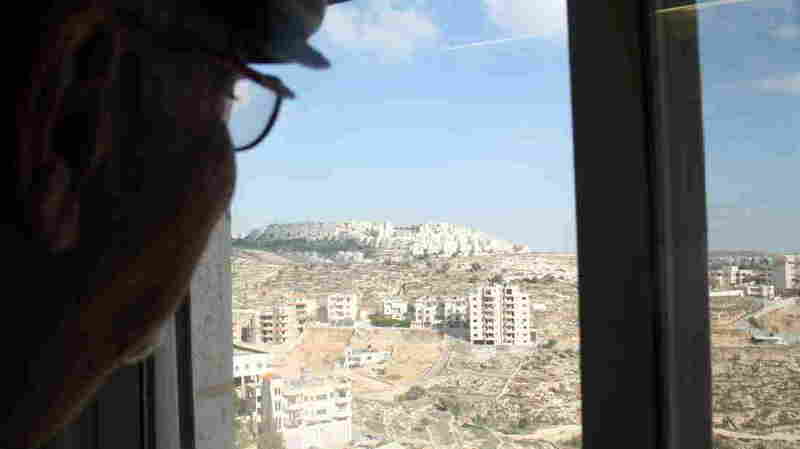 He's director of The Applied Research Institute Jerusalem, a Palestinian organization for sustainable development, and outside his window is a hill covered in rows of homes: the Jewish settlement of Har Homa. Isaac listened keenly to what U.S. Secretary of State John Kerry said in his recent speech following the U.S. decision to not veto a U.N. Security Council resolution condemning settlements built on land Israel captured in 1967. Kerry defended the move, saying the West Bank and east Jerusalem are up for negotiation and settlements jeopardize the chances for peace. Israeli leaders were exasperated by his speech. Isaac was encouraged. "Frankly, I was very happy hearing it," said Isaac. In his address, Kerry argued that continued Israeli settlement construction would make it impossible for Palestinians to ever have a sovereign state. Isaac said he sees this possibility unfolding before his eyes every day, out his window. Har Homa, an Israeli settlement on land captured in 1967, is now home to nearly 20,000 Israelis. While Israel considers it a part of Jerusalem, it looks close enough to be a part of Bethlehem. Isaac pointed out construction cranes where new areas are being built. "You can see it is not done haphazardly," Isaac said. "The intention is to form a wall of settlements, to totally segregate Jerusalem from Bethlehem." In other words, it would stand between Bethlehem and the city Palestinians claim as their future capital. President-elect Donald Trump is expected to be supportive of Jewish settlements. Isaac hopes other world powers will get involved to restart peace talks. "The United States cannot be the only broker for the negotiations," Isaac said, "and we want a well-defined timeline." On Saturday, Palestinian Authority President Mahmoud Abbas said, "We want to emphasize our willingness to work with the newly-elected American administration" to reach a two-state solution to the conflict. Yet in recent days, Palestinian officials have indicated they wish to bypass the Trump administration and have the international community lead peace talks. In January, some 70 countries are expected to meet in Paris to discuss the fate of Israel-Palestinian peace talks. They may use the recent U.N. resolution, which deems Israeli settlements illegal, to help define the terms of the talks. Israel rejects the notion that settlements are at the root of the conflict. It blames Palestinian violence and Palestinian refusal to recognize Israel as a Jewish state. In addition, Israel stresses Jewish ties to east Jerusalem and the West Bank, going back to the Bible. Israel's prime minister, Benjamin Netanyahu, has said he supports the eventual establishment of a Palestinian state alongside Israel. But some Palestinians think it's already too late to create a Palestinian state. "It's too complicated now, with the facts on the ground, with the Israeli settlements within the West Bank," said Palestinian travel agent Rana Salman. "Geographically it doesn't make any sense." She lives around corner from Isaac's institute, and also has a front row seat overlooking the Har Homa settlement. She cites Israeli roads, checkpoints and buildings throughout the West Bank, and doesn't believe Israel and the Palestinians can be separated. Instead, she'd like Israelis and Palestinians to live together in one state — regardless of what that state would be called. "I don't care now about the name. More about having human rights for everyone, equal rights, and living in dignity for everyone," Salman said. John Kerry spoke about this in his speech, too. "If the choice is one state," Kerry said, "Israel can either be Jewish or democratic. It cannot be both."